The images do not depict a real three (or seven) headed snake. A photograph of a normal, one-headed snake has been digitally manipulated to create the fake multiple-headed versions. Scroll down to see the original one-headed image. 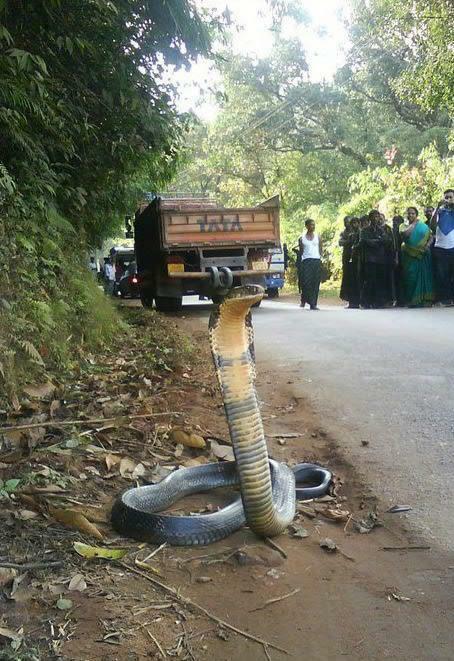 This message, which circulates via social media and email, claims that an accompanying photograph depicts a three-headed snake found on a roadway somewhere in India. Clearly, some prankster has simply taken the above photograph and added the extra heads using Adobe Photoshop or another digital manipulation tool. The original image can be seen on the Canvas image sharing website and elsewhere on the Internet. Such digital tomfoolery is not unprecedented. Several other fake multiple-headed snake images have circulated in recent years, including ones supposedly depicting five headed cobras. Animals, including snakes, are indeed sometimes born with more than one head, a condition known as Polycephaly. However, the fake picture included in this hoax message does not depict a genuine case of Polycephaly.